Today I finished a banjo rebuild that was years in the making. I posted some pictures of the necks a few weeks ago. One bare, one getting a Tung oil treatment. This banjo was in pretty rough shape with loose and worn frets and binding and pretty scratched up. Obviously it had been used a lot. Today I learned why. Because it’s the good ones that get played! I finally got to play it- and proves this out. It’s a very interesting Rich and Taylor JD Crowe model from 1992, and no serial number. The story begins in 1992 when Greg Rich, (the very well reputed and well known banjo designer and builder) had recently pulled the Gibson banjo division back from slumping quality single-handedly. He was hired to help them make great banjos again. The “Rich era” Gibsons bring top dollar as they are known for being some of the best Gibson banjos since the epic prewar banjos. After accomplishing this feat, Gibson and he parted ways. The next venture for him was a partnership with the skilled guitar and banjo craftsman Mark Taylor. His father is usually mentioned when talking about Mark, but Mark grew up with a top notch luthier and resonator guitar builder- his dad, Tut Taylor. However in all fairness, Mark’s skills and abilities are known independently of his father’s legacy as he continued building quality Crafters of Tennessee banjos later on. The new partnership would become known as “Rich and Taylor banjo company”. With The abilities both of these men had, they were sure to produce some outstanding banjos. 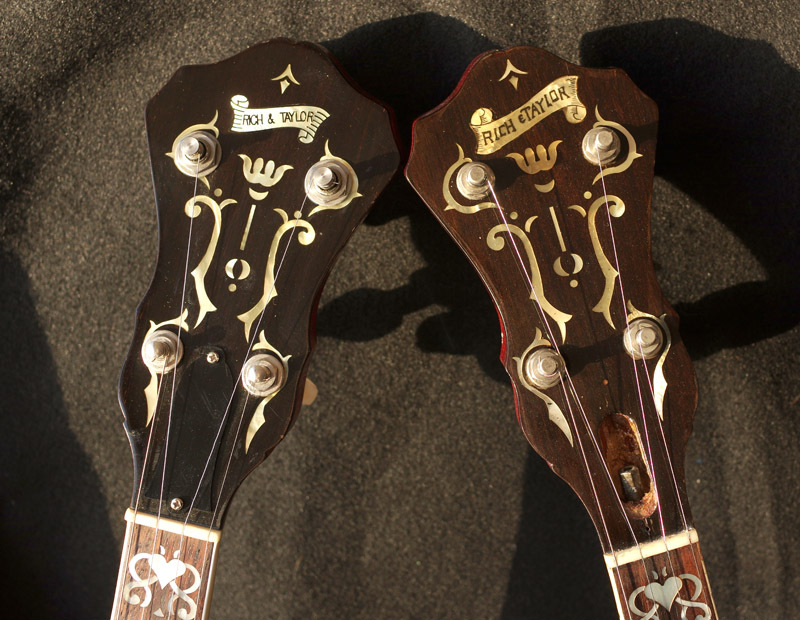 Rich and Taylor banjos are, in every sense, Gibson copies, and if you think about it, with Greg RIch having redesigned the Gibson banjo line, These could in fact, be called “Greg Rich era Gibson copies”. The designer of the best GIbson banjos since the prewar days was now using his own name on a banjo. What could be better? After a few short years the two men parted ways and the company was no more. Today their vintage banjos from the early 1990s are known to be equal in virtually every way to the Greg Rich era Gibson banjos. They share every notable feature; Designer, Greg Rich. Materials, Three ply rock maple rim, Kulesh spin cast and machined tone rings, high grade mahogany, nickel plated brass hoop, pot metal flange, and beautifully executed with skill and precision. The “Greg Rich era Rich and Taylor” I just finished- (I would have rather left in un-restored condition but it wasn’t playable). To repair it, it needed a lot of work and I just didn’t get to it for a couple of years. Now that I can actually play it, I’m amazed at the tone, and it’s one of the loudest mahogany banjos I’ve ever played. And now, it represents an interesting story of a short-lived company that for a brief time- made history building some of the best American banjos of the 20th century. Previous post: Have you thought about doing a speed neck? Here is a “tweak” you might like! Next post: An easy and inexpensive solution to attaching a strap to an open back banjo! My r&t is the one Ryan Cavanaugh used to record his “Songs For The New Frontier” album. It is a workhorse and sounds as good as any banjo ever made.